This is a film about a cop. This is a film which takes place in Ireland. Let's start by clearing up the mysterious title by explaining that "garda" is the Gaelic word for police in general or a single policeman. Pay attention; you will see policemen with this on the back of their police coats and on the side of their police cars. Apparently it is common to use the English expression "the guards" in everyday speech hence The Guard really means The Cop or The Policeman. Ah, those Irish. Ah those Irish indeed. Who can't love that accent? At times you have to pay close attention to what's being said which is all the more curious since we are listening to people speaking English. Well, English with an accent so thick you could cut it with a knife but that just adds to the charm of this tale of another world, and believe me Ireland is another world, and the tale of a fish out of water. Sergeant Gerry Boyle is an unorthodox Irish policeman and we could argue whether or not he's colourful or just plain corrupt. Of course, if he wasn't corrupt, ah, colourful we wouldn't have much of a story, would we? Boyle is played by the Irish actor Brendan Gleeson whose had some fairly hefty roles, maybe the most recent and notable being the character Alastor "Mad-Eye" Moody in the Harry Potter series. Gleeson is just perfect for this part playing the laid-back cop with the slightly jaded but practical view of the world. After a humorous introduction to our corrupt colourful protagonist, we discover his idyllic life is going to be turned upside down by the arrival of an international drug smuggling gang who have selected his little port town to dock their boat containing half a billion dollars in cocaine. Along with the criminals come the good guys in the form of the American FBI led by Special Agent Wendell Everett played by Don Cheadle. Looking at the film as something of a buddy picture, I can't think of two guys more at opposite ends of the spectrum which is certainly fodder for lots of comedy. The FBI agent puts on an information session about the drug smugglers and shows pictures of the four white men. Boyle puts up his hand and asks, "I thought only black lads were drug dealers. And Mexicans." Boyle's superior demands that he apologise to the FBI agent (it's Cheadle who's black) and when Boyle asks why, he's told it's because of his racism. Boyle responds surprised, "I'm Irish. Racism is part of my culture." Later, as this type of exchange continues between Everett and Boyle, Everett looks suspiciously at Boyle and says, "I can't tell if you're really bleeping dumb or really bleeping smart." The film has a side story about Boyle taking care of his mother who is dying from cancer. In fact, we seem to have arrived at her last days and there are a couple of scenes with Boyle visiting her. This softens the Boyle character and makes him out to be a nice guy. - Yes, he may partake of drugs once in a while, yes, and maybe he drinks on the job and cavorts with hookers but he is a good guy. - I immediately recognised the actress Fionnula Flanagan but couldn't remember where I had seen her. A little research led me to the charming and amusing 1998 film Waking Ned Devine however in looking at her filmography, I see this is one busy lady. I am sure any reader would probably recognise her from one thing or another. Another recognisable face was Mark Strong as one of the drug smugglers. Here is another actor with quite a filmography to his name. I remember him recently as the main antagonist in the 2009 film Sherlock Holmes. All in all this is an excellent film. Believe me, the Irish setting makes for quite an unusual story and that unto itself is very charming. Don Cheadle as the American is the amusing fish out of water and for those of us who are very much stuck in the North American culture, this will be a reminder, an amusing reminder, that we are not the be all and the end all when it comes to cultures using the English language. I highly recommend this film and with Rotten Tomatoes giving it a score of 94%, I see I'm not the only one who found this to be a delightful piece of entertainment. 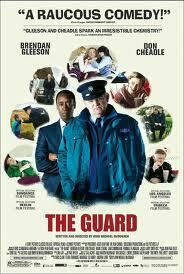 The Guard is an Irish black comedy film written and directed by John Michael McDonagh, and starring Brendan Gleeson and Don Cheadle. Garda Síochána na hÉireann (Irish for "Guard of the Peace of Ireland"), more commonly referred to as the Gardaí ("Guardians"), is the police force of the Republic of Ireland. The service is headed by the Garda Commissioner who is appointed by the Irish Government. Its headquarters are located in the Phoenix Park in Dublin. Pronounced "guarda" and meaning "guard" or "guardian". Usually the short form of garda síochána, the "guardians of peace". This title was chosen for the Irish police and is used everywhere in the Republic. It is quite common to use the more English expression "the guards" in everyday speech. The police in Northern Ireland use the simple "police" as identification.